Eloy Enciso's second feature film, Arraianos, is named for the small Galician village in which it is set. This is never announced or revealed within the film itself, however. Outside reading about Enciso's work (such as you are doing right now) would be the only way to discover this information. If we take Arraianos as, to some degree, an ethnographic work—and about half of Enciso's 70-minute film comprises documentary examination of the patterns of daily life in this rural community over a year or so—then such a lapse is a kind of alignment with a radical tradition. Certain experimentally inclined, observational ethnographic films presume that textual intrusion is not only a corruption of the potential truth-value of the imagery, but more crucially, the imposition of the filmmaker's "terministic screen" (to borrow Kenneth Burke's term) over the perfectly valid and possibly self-explanatory lifeways of the ethnographic subject. This anti-textual tradition in ethno-exploratory cinema spans decades, from Robert Gardner to the late Mark LaPore. But this is not where Enciso is coming from, at least not entirely. 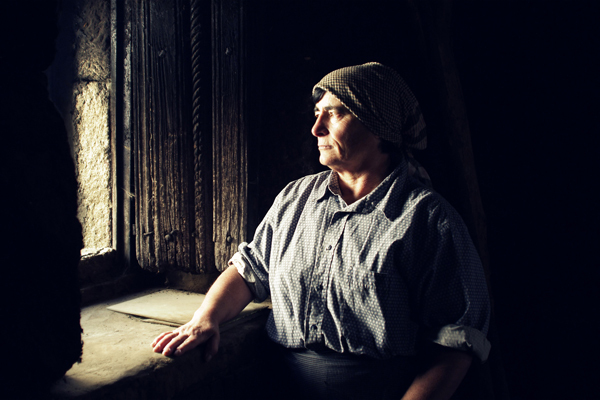 Significant portions of Arraianos consist of Enciso carefully observing real-life activity in the village. While one of the most noteworthy sequences involves two men in a cattle stall assisting a cow in a breach-birth, using a rope, a pulley, and some unpleasant reaching-in by hand, other segments are more prosaic. But they are no less absorbing for their mundane character. A boatman goes down to the dock with a long pole in winter, in order to break up a thick sheet of ice. Two lumberjacks work the forest; one with an axe, the other with a saw. An elderly woman tends her farmland, harvesting sugarcane plants. A middle-aged priest conducts a service for a small, attentive group of parishioners. Enciso presents these scenes, it is worth noting, not with the extended takes and master shots of "official" ethnography, but with relatively conventional decoupage. Enciso and his editor, Manuel Muñoz, tend toward an average shot length that is on the brief side (three to four seconds generally, a bit longer during the calf birth sequence), and freely alternate between close-ups and medium long shots. So thinking strictly about these documentary sequences within Arraianos (which, mind you, are only about half the film—more on this below), Enciso's editing and pacing sends a slightly different signal than his observational style and his decision to refrain from commentary. By dint of its unobtrusive but nevertheless rather thorough coverage, Enciso's footage raises questions as to whether the director filmed activities that would have been "happening anyway" within the village, or if perhaps these commonplace activities were staged for his film. This inevitably leads us back through another ethnographic trajectory, a tradition that in some ways inaugurated the very idea of documentary itself. I'm speaking of the work of Robert Flaherty, of course, whose films frequently entailed staging or restaging events so as to properly display some aspect of the lives of his subjects. This (along with an undeniable romantic streak in his work, part and parcel of what critic Fatimah Tobing Rony has called the "salvage paradigm") has led to Flaherty becoming anathema in academic film studies for decades, but in recent years he has come back into the fold, in part for his reliance on fiction (or "textuality") as an avenue to truth. This marks him as the starting point for a lineage that, in recent years, can be seen in filmmakers as otherwise dissimilar as Lisandro Alonso, Michelangelo Frammartino, and José Luis Guerín. Arraianos alternates documentary material with para-fictional material, performed by the same individuals we have seen in the documentary sequences. To fully explain how Enciso orchestrates these gestures, it would be necessary to throw a number of words into irritating scarequotes, which I will refrain from doing. These are not exactly performances, and these sequences, while firmly based in fictional material, are also documents of the individuals' iterations of the text in question. Arraianos dips directly into narrative or fictional cinema, but does so in a way that partakes of a particular tradition, one as radical within its own mien as the Flaherty or Gardner approaches are within ethnography. In fact, it could be argued that there is a direct correlation. Throughout Arraianos, we see and hear the various villagers performing (or more accurately, flatly declaiming) portions of the play O Bosque ("The Forest") by Galician playwright Jenaro Marinhas del Valle. Marinhas, who was active during the Franco regime, tended to abjure strict realism in favor of philosophical and political themes, seeing his theater as a tool for education. His modernist style can be observed in the segments Enciso presents in Arraianos, such as the opening scene. Two women (the farmer and a woman we see later, working at a sewing machine) stand in the middle of a forest of spindly trees. They are lost and, while making no eye contact, speak with one another about the problem of escaping the forest. One woman contends that all trees look the same, which compounds their dilemma. The other chides her. "A chestnut is nothing like a eucalyptus. Everything about them is different. Even the smell. Don't you think?" Then the first woman counters, "Insignificant things are not important. You have to get used to seeing the world and mankind without complexities, in blocks [...] so when we say ‘stone,' ‘tree,' ‘man,' we shall know what they are, without endless distinctions, like how many types of stones, how many types of trees, how many types of men there are." This exchange continues in kind, but we can see what is at stake. In dramatic terms, Marinhas is combining a somewhat intellectual Brechtian approach with a Beckett-like existential framework, setting his characters within an abstract quandary that they must reason their way out of. And more specifically, Marinhas is posing a challenge between phenomenological thinking, which attends to the radical particularity of things within the world in order to understand their irreducible singularity, and an ordinary-language version of Lockean empiricism, in which things are understood by their generality and categorization. 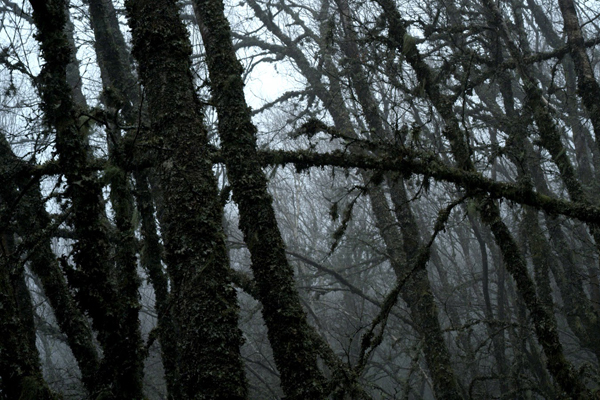 But even more significantly, how does Enciso stage his filmic iteration of O Bosque? It is not only that he asks his rural Galician subjects to perform or recite the text in a clear but somewhat uninflected way. He also films them standing quite still within a sun-dappled forest, delivering their lines as if to the trees themselves. He appears to use the HD digital technology to record the performers with live sync sound, without post-dubbing. So this sequence of Arraianos, and others like it within the film, instigate a relationship with a fictional cinematic (or cinematographic) tradition that has at least two primary sources: the films of Robert Bresson and those of Jean-Marie Straub and Danièle Huillet. Like Bresson, Enciso has his performers model the texts, essentially remaining themselves and existing alongside the Marinhas material rather than dramatizing it. Perhaps more importantly, Enciso draws on Straub-Huillet's treatment of literary text as a material object within the cinema, something that is delivered not as an event for replicating emotions existing elsewhere but as sound and sense that, in the strict sense of the time and place of filmmaking, reflect a performer moving soundwaves in a particular way, bringing anterior writing into the present as recorded speech. As such, the Arraianos villagers' work with Marinhas' O Bosque is as much a "documentary event" as their work with lumber, ice floes, or felled trees. This Straubian movement between the structure of text and the textures of a particular communal habitus has been seen most recently, and most effectively, in the cinema of Pedro Costa, particularly in his Fontainhas films. But Enciso is doing something very different indeed. Unlike Costa, who integrates observational with literary models (for example, the use of the Robert Desnos poem throughout Colossal Youth), Enciso keeps these modes almost entirely separate within Arraianos. The sequences in which the villagers are performing standard tasks alternate with those in which they are performing passages from O Bosque. What does this separation mean? The two textures of content, and arguably the lineages through which we might best understand them, are mutually entwined. The presence of the declamation of Marinhas's play introduces the question of partial fictitiousness into the documentary material, as does Enciso's meticulous editing and framing. At the same time, the fact that Enciso surrounds the performance segments with apparently quotidian, nonfictional elements, as well as adopting a neo-Straubian approach to their staging and recording, indicates that these passages are more than performances. 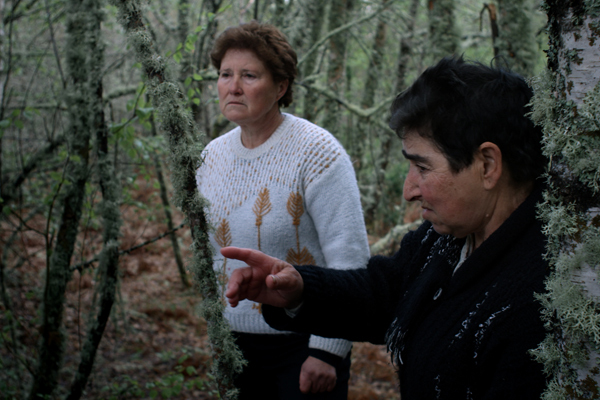 Instead, they are textual transactions between Galician villagers, a Galician filmmaker, and a particular play, which itself has been said to reflect Galician identity and its struggles, as much as any "day in the life" documentary might be said to do. So Arraianos is a documentation of an experiment in cross-temporal communication, not unlike Gabriel Abrantes's recent short film Birds—with which it has been paired at the Moving Image's First Look program—crosses time and culture by transposing Aristophanes to contemporary Haiti. But it is the separation of the elements that distinguishes Arraianos from so many of the other films from which it inherits ideas and procedures. By toggling between its major aspects, rather than attempting a smooth integration of them, the film makes its dialectical premises highly visible, which in its own way embodies the philosophical and political imperatives of Marinhas's original efforts. We witness a great deal of O Bosque being staged by the villagers, besides that opening sequence. The same two women discuss a parable about "Pitipin," a daydreamer whose musings were abetted by his laboring brothers. The priest reappears as "Baqueano," a forest god who stops men in their tracks, foretelling an apocalypse that only he can see. All of this is presented with the same facticity as the milking of a cow. But at two points in Arrainanos, Enciso takes us inside the village bar, where we see and hear the same group of men stopped cold in the forest. They are shown drinking and singing folk songs together while one of the men accompanies them on the accordion. The first song is a fishermen's ballad; the second commemorates "the seven women of Miño" who overthrew the landlord. These scenes are shot in highly formal set-ups, with close-ups that are lit like classical portraiture and shots that are framed for maximum aesthetic impact. Although these sequences may seem like light entr'actes within the overall fabric of Arraianos, they are actually the pivotal scenes, in very literal terms. These performances of folk songs are part of the ethnographic content of the film. However, their structured presentation reminds us that, like Marinhas's O Bosque, the songs are texts, not unproblematic portals into an authentic state of Galician being. With this reminder, Arraianos applies the logic of separation as a kind of two-sided map, whereby any and all ethno-content is revealed to have been, all along, a fully textual production, and the villagers' engagement with textual modernism is itself an ethnographic event. Eloy Enciso's work is aligned with that of a handful of contemporary radicals, such as Pedro González-Rubio and Simone Rapisarda Casanova, who are redefining the very category of the ethnographic. We have come a long way since the time when reflexivity meant handing the camera to the "natives."